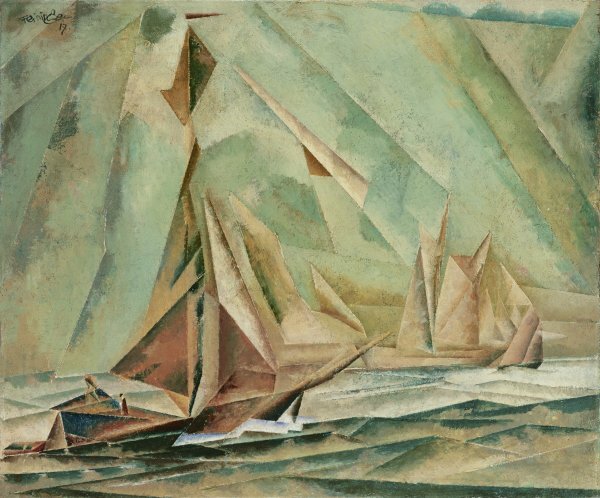 Lyonel Feininger, an artist linked to Der Blaue Reiter (The Blue Rider), evolved gradually towards faceting and formal construction under the influence of the Cubist and Orphist works of Léger, Delaunay, Metzinger, Gleizes and Le Fauconnier. Ships is one of the seventeen works Lyonel produced in 1917. His interest in marine themes, which had first arisen during his childhood and had grown as a result of his visits to the Baltic Sea during the war years, is combined with a formal and fragmented geometric language that attests to the artistic novelties he discovered during his years in Paris, particularly during his visit to the Salon des Indépendants of 1911. In 1917, when Lyonel Feininger painted the present work in the Thyssen-Bornemisza collection, his situation as an American residing in Germany had been complicated by the United States’ joining the war. Despite these misgivings, his solo exhibition held at the end of the year in the Der Sturm gallery in Berlin was a success with both public and critics and marked the beginning of his rise to recognition.